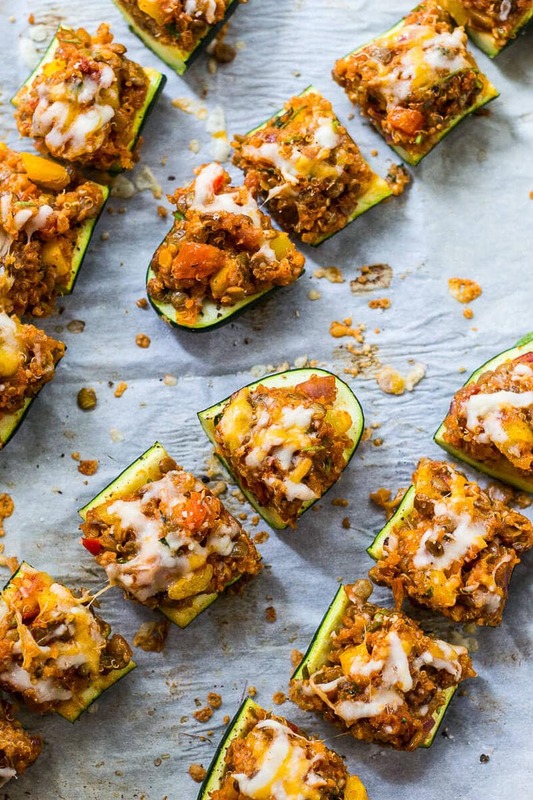 These easy Mexican-inspired Zucchini Boats are the perfect appetizer to serve even the pickiest crowd. Gluten-free and vegetarian, they’re a versatile and healthy appetizer that everyone will love, and they cater to many different dietary restrictions. I received compensation in exchange for developing this recipe for FBC2016 in partnership with Half Your Plate. Thanks for supporting the brands and organizations that help keep my blog up and running! Prepare yourself for a delish, healthy, vegetarian, gluten-free appetizer housed in a vegetable! Sounds too good to be true, right? With the Food Bloggers of Canada conference coming up, I am SO excited to share this recipe because I developed it in partnership with Half Your Plate to be featured at their Friday night cocktail booth at the conference in downtown Toronto. I mean seriously, HOW COOL IS THAT?! If you don't know about this yearly conference by now and you're a Canadian food blogger, you are SERIOUSLY missing out. Food Bloggers of Canada has been an AMAZING resource and I'm so thrilled to be able to attend this year. There will be plenty of opportunities to network with other talented bloggers and finally meet some online friends in person, and I think I'm most excited to learn some new cutting-edge blogging techniques, strategies and skills that are permeating the industry in order to take my blog to the next level. If you read my income reports, then you'll know that I've been blogging full time since March 2016, and while I have learned SO much and had so many incredible opportunities and clients, I am still learning so much and really feel the need gather with others in a professional atmosphere. 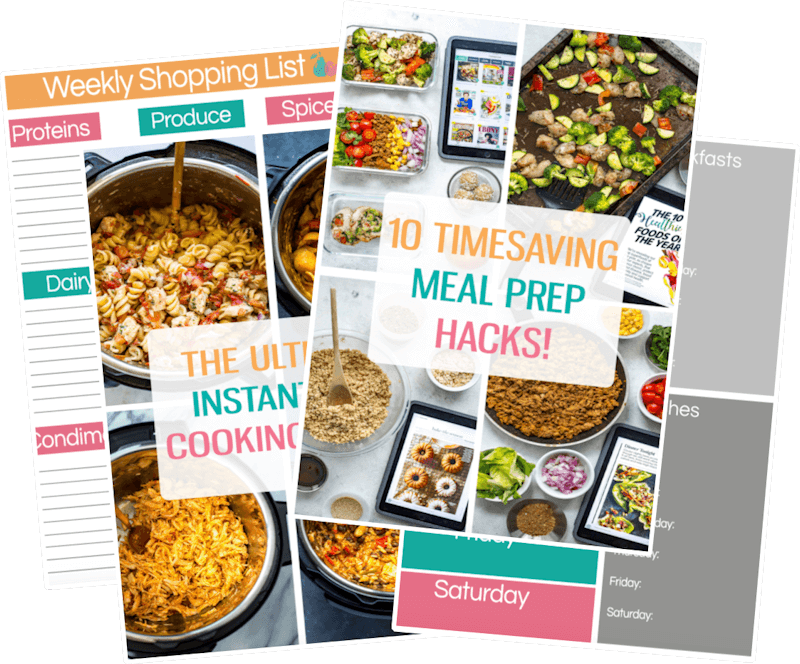 I still want to improve my food styling and photography and learn about new ways to monetize and diversify my income and…I am out of breath LOL. Basically, FBC 2016 is going to be a great step in helping me achieve this. 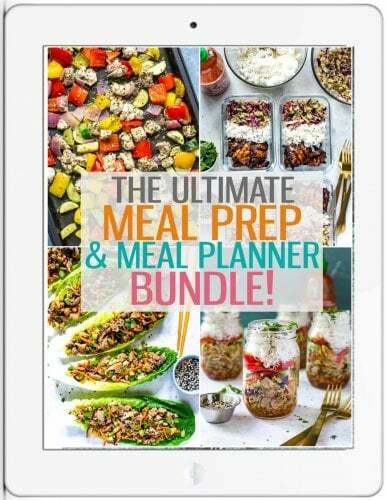 Half Your Plate is sponsoring me to attend this conference so I shouldn't fail to mention how grateful I am to have developed some super cool recipes with them and have the opportunity to saturate myself even further within the media industry – as a new grad starting out it means so much to me. Speaking of grads, I am going to be GRADUATING WITH A MASTER'S DEGREE TODAY. HOLYYYYYY. I can't even tell you how monumental and important this weekend is going to be – I just feel like I'm experiencing such an adventurous time in my life and I can't wait to see what happens next. And I get to literally make and eat food all day. Can we say living the dream?! 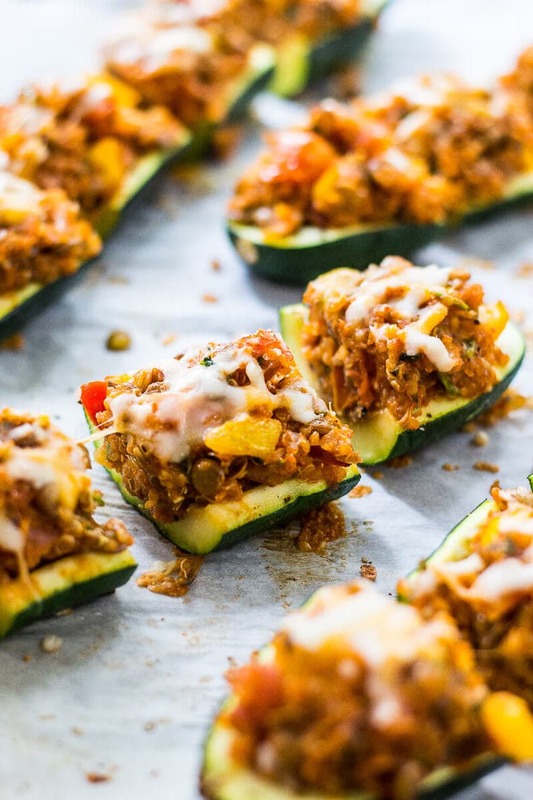 But getting back to these Mini Vegetarian Tex Mex Zucchini Boats though. That's what we're really here for right? Well, they are superrrrrrrrrr easy to make – wash, scrape, stuff, bake, done! 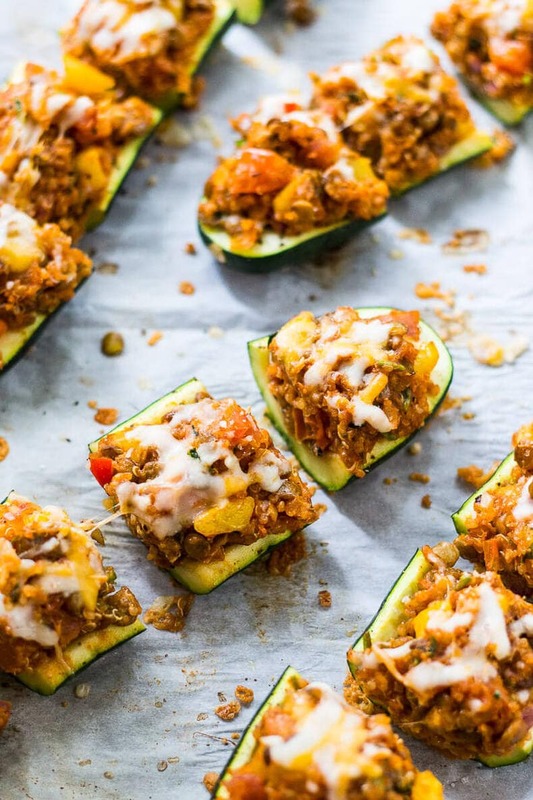 These Mini Vegetarian Tex Mex Zucchini Boats can also be customized if you would rather add a little meat in there – think ground turkey, shrimp, diced chicken. The options are endless. 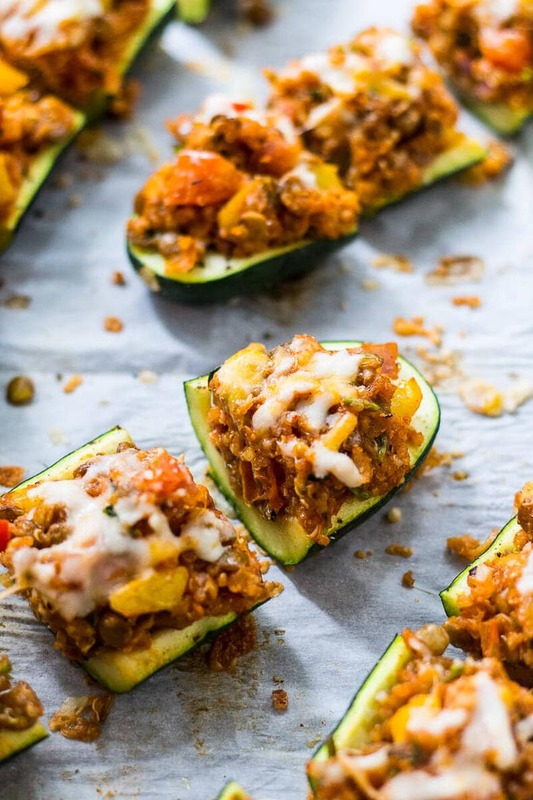 You could also switch up the theme of these cute little zucchini boats. I would love to try a Tandoori chicken version or a chickpea chana masala version, maybe even a Mediterranean or Greek-inspired version with some olives and antipasto. But anyways, I'm starting to drone on here. 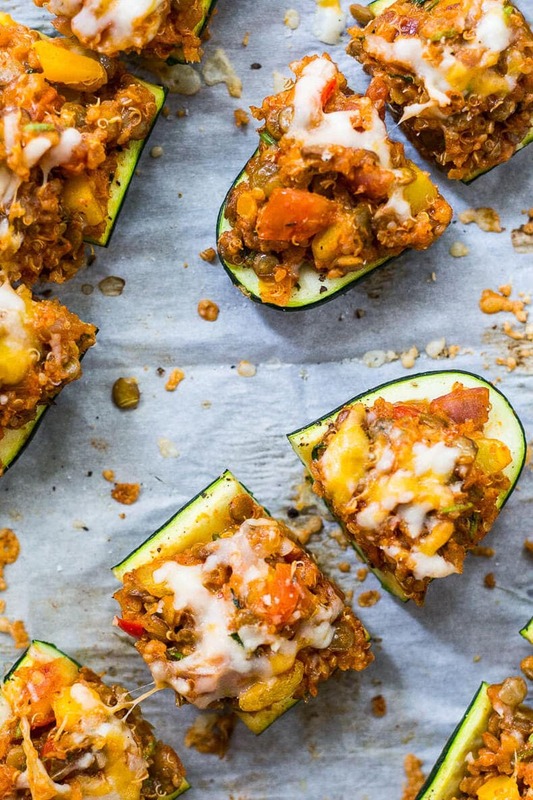 Will you be making these Mini Vegetarian Tex Mex Zucchini Boats? If you try any of my recipes be sure to let me know on Instagram, Twitter, Facebook or in the comments – I'd love to see what you come up with! Cook lentils and quinoa each according to package directions. Slice zucchini in half lengthwise, then scoop out flesh. Place on a parchment-lined baking sheet, then season with salt and pepper. Bake for 8 min until zucchini is just tender. Meanwhile, heat olive oil in a large frying pan on med-high heat. Add all filling ingredients except for cheese and cilantro. Saute for 5-6 min, then remove from heat, stirring in cheese and cilantro. Remove zucchini from oven and stuff with filling, then sprinkle with remaining 2 tbsp cheese. Bake for another 2 min until cheese is melted. 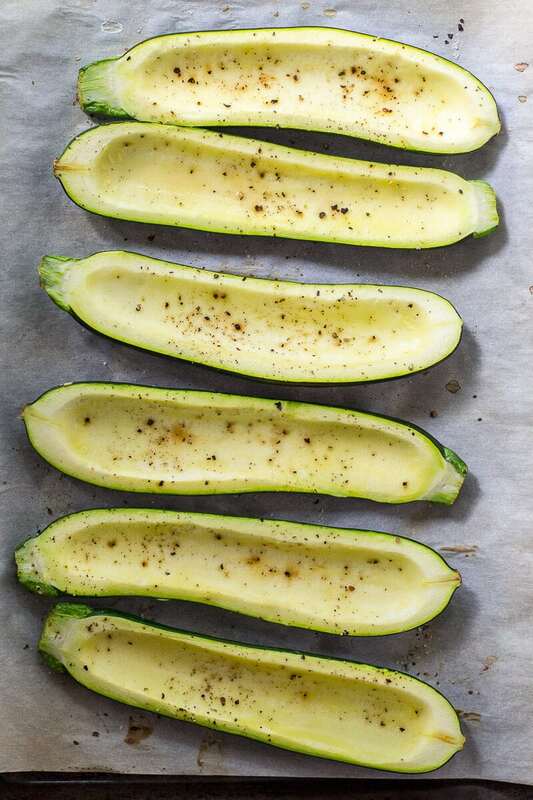 Remove from oven, then cut each zucchini boat into four different pieces. Oh these look SOOOO GOOD!! I’ll be adding these on my list to try out this week! Thank you so much Jaclyn – it was SUCH a whirlwind weekend and I’m still catching up needless to say! I will be coming out with a post within the next couple of days so stay tuned for a wrap up. You should TOTALLY attend last year. I honestly learned so much and I really think I will be able to take my blog to the next level because of it!